Remember real estate is risky affair as it involves large amount of black money. You must consider few points before buying property for investment. At Last I would like to say – Remember you must start investing money for retirement as early as possible. Don’t invest in financial product which you don’t understand (when in doubt find out). Never park your all money in single financial instrument. Take help from financial experts whenever required. 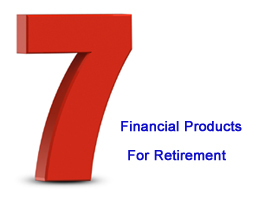 Do share your views about “7 financial products for retirement planning”.